Should You Be Digging into GrubHub Stock? GrubHub (GRUB) is a food delivery service that also operates under the Seamless and Eat24 platforms currently servicing over 80,000 restaurants. On Thursday the company served up its Q4 earnings report and investors initially threw the results into the garbage, sending shares down some 12% to an intraday low of $66.50. But, once people started chewing through the numbers, they found some tasty items and shares ran back nearly unchanged. On Friday, it followed through pushing the stock back to the $85 level. As you can see, this is the second consecutive quarter the stock gapped lower following a report. But, this time it found major support at the $66 level and the chart now has a big bullish candle with support at the $80 level. I’ve written before about how I love Grub’s business model which is a prime example of the network effect in which scale matters and becomes a defensive business moat. While there is growing competition from UberEats and Doordash among others, Grub has a first mover advantage giving it economies of scale in terms of both installed customer base and the number of restaurants signed up. Locations on a busy street or well-trafficked area usually command higher rents for good reason; they drive business. Likewise, as consumers are increasingly ordering food online (or with mobile app) for delivery, it becomes crucial for restaurants to locate or set up shop where they are most likely to be found, providing an easy transaction experience. Just as consumers are pleased to be able to clean out their drawer full of paper menus, they don’t want a screen cluttered with food delivery apps. They want one app that covers the most choices, and Grub is increasingly getting a spot on their mobile device. The stock initially nose-dived because the headline numbers of revenue and eps were below expectations. 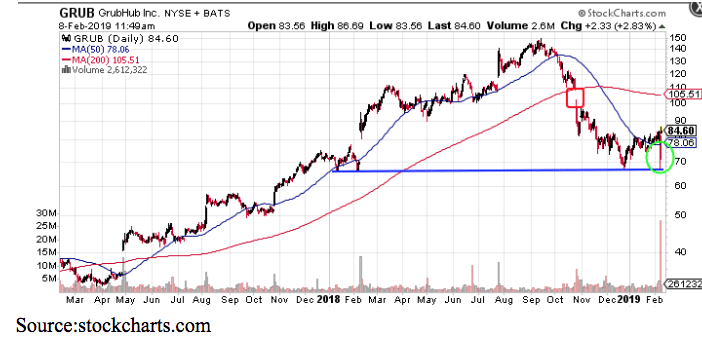 But on further review, investors and analysts, three of which upgraded the stock today, realized the company is still growing at a torrid pace with revenue up 42% and eps up 35% from a year ago. As the location/app of choice, Grub commands upwards of 25%-30% fee on each delivery, providing the company with huge margins. That’s a fat fee many restaurants find more economical to outsource delivery because it can better adjust to the supply-demand of busy time periods. Also, as mentioned, they simply cannot forgo being listed, or they risk losing customers. Grub has been a real game-changer, now expanding from focusing on independent restaurants in dense urban markets to doing deals with regional chains such as Hurricane Grill, Sushi Samba and national chains like Buffalo Wild Wings and Red Robin Gourmet. Just yesterday Yum Brands (YUM) said it will us Grub as the platform for Taco Bell’s national delivery rollout with orders over $12 qualifying for free delivery. This offer should help Taco Bell ramp up an installed base of customers that become accustomed to free delivery and lead to higher average orders. 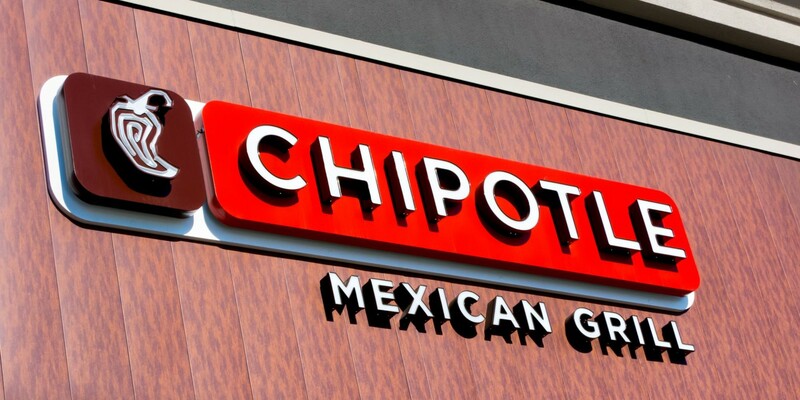 Revenues are still growing at nearly 50% annually and may accelerate as the company, which initially target independent restaurants in dense urban locations, begins to sign national chains. Look for sales to top $300 million next quarter, a 42 % increase over an annual period, and over $850 mm for the year. 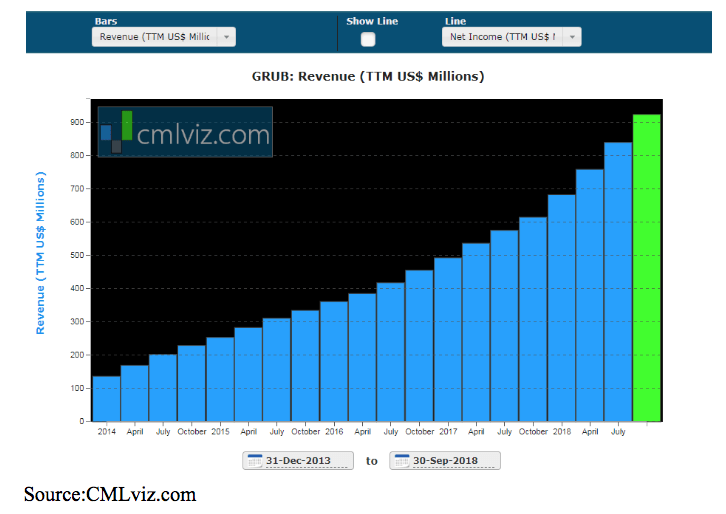 Grub still has a long runway of growth, and the recent sell-off is a great opportunity to get the shares at a discount.